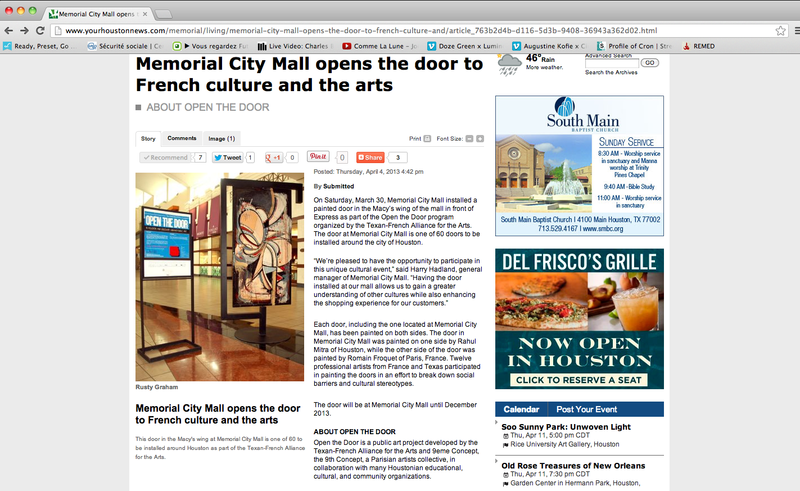 On Saturday, March 30, Memorial City Mall installed a painted door in the Macy’s wing of the mall in front of Express as part of the Open the Door program organized by the Texan-French Alliance for the Arts. The door at Memorial City Mall is one of 60 doors to be installed around the city of Houston. Each door, including the one located at Memorial City Mall, has been painted on both sides. The door in Memorial City Mall was painted on one side by Rahul Mitra of Houston, while the other side of the door was painted by Romain Froquet of Paris, France. Twelve professional artists from France and Texas participated in painting the doors in an effort to break down social barriers and cultural stereotypes. Vous lisez actuellement « Memorial City Mall opens the door to French culture and the arts » à Romain Froquet ///// The blog.